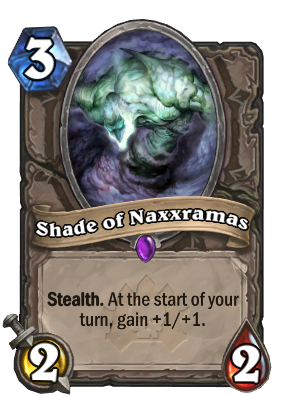 The Shades of Naxxramas hate the living. They even have a slur they use to refer them: Livers. If this card would be 1/2 or 1/3 it would be great! It's okay card if your collection is lacking that much but it's very niche when it comes to its usefulness. Additionally this minion is questionable value as at a point my opponent actually uses it to attack, it's rather easy to dispose and has likely hindered my opponent more than helped them. Essentially, even though it's supposedly neutral card it's more a priest card as they can keep it alive better to let it become a big threat. So good for board control and goes really to waste if you try to keep it too long under stealth. Also, if your opponent for whatever reason don't play their good minions because they think that they get cleared by this minion then you can take advantage of their mistake. Still doesnt blow up as quickly as questing adventurer, but since nobody plays him this guy is still ok. Yes, weak to silence, but what do you rather have: silencing Shade or silencing your Sylvanas/Vol'jin? This card's flavor should have been a 50 shades of grey reference. Because 50 shades of naxxramas... 50 shades of grey...? Looks like a mini-Gruul with stealth! Does any one ever saw/craft this card in gold? Great card, however when I saw it i tought it would be used much more often that it currently is being used... Oh well. I really want to get this to work in a Shaman deck with Windfury and such. Any ideas? Yeah without seeing the gold version, I couldn't understand the artwork. Sorry Ittoku Seta don't like this one bit. Deadly Shot will take this out at any +/+ even with stealth if you can get it alone on the board. Stealth has never been a problem for paladin decks. Equality, consecration, avenging wrath. When you think about it almost all of the classes have relatively easy ways to kill this guy, worst case scenario just throw down a taunt. All classes have way to kill miion under stealth protection? Nope. Other classes have chance to kill it only in first/second turn after it apears. I'm pretty sure every class has a way to deal at least 2 damage to stealth / untargetable. Priest - Holy Nova / Soulpriest + Circle. I'm sure I'm missing a few class specific ones but that's off the top of my head. Also non class specific ones. Gelbin Mekkatorque - can turn it into a 1/1. also I know this post was before GvG but classes now have more options. Madder bomber, explosive sheep, all orges in GVG have a chance to bypass stealth etc.